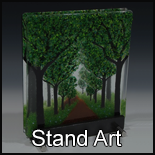 I create fused glass landscapes by using sheets of clear glass combined with glass paints, enamels, pulled vitrigraph stringers and colored, crushed glass frits. Each piece is fired multiple times at a variety of temperatures. 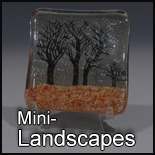 Due to the repeated firings, my work has great depth and dimension, as with each firing, I add layers of both clear glass and colored crushed glass frits. The final firing usually completes at a slightly lower temperature so that the final layer of frits leaves a textured surface. In addition, the tile is mounted in front of a mirror when complete. The mirror adds another layer of dimension to the piece, as the reflection of the tile will shift in relation to the viewing angle. The mirror also provides an indirect source of light to backlight the piece.